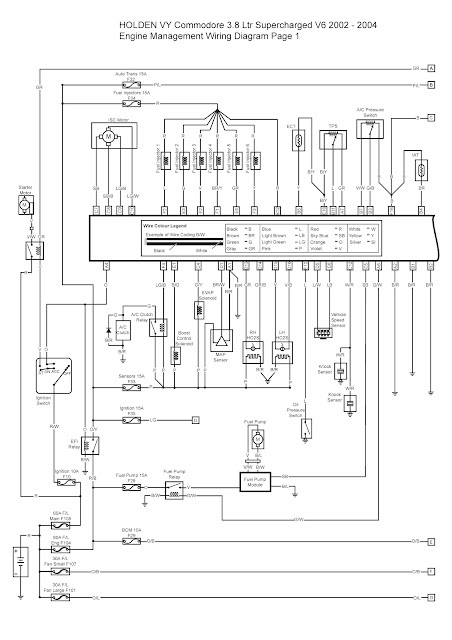 Responding the emails requesting Schematic wiring diagram on Holden Commodore, so here I provide the 2002-2004 Holden VY Commodore 3.8L Supercharged V6. In this schematic wiring diagrams you will see the parts namely: Auto Transmission, Fuel Injectors, A/C Pressure Switch, Starter Motor, A/C Clutch Relay, Boost Control Solenoid, MAP Sensor, Vehicle Speed Sensor, Knock Sensors, Ignition Switch, Oil Pressure Switch, Fuel Pump Module, Fuel Pump Relay. You will also see the Wire Color Legend. It shows the wire color coding such as: black-B, brown-BR, green-G, gray-GR, blue-L, light brown-LB, light green-LG, pink-P, red-R, sky blue-SB, orange-O, violet-V, white-W, yellow-Y, silver-SI. Be sure to notice the parts and the wire color coding. By doing so you will be able to do your wiring works easily. For more details please observe this clear and readable image below. Click on it to enlarge.